As a teenager, Halloween has definitely changed for me. Being a kid, I remember it being almost equivalent to Christmas, and it actually made me want to go to school whenever it fell on a weekday. Often, I’d stay up the night before, unable to sleep from the excitement, and the next morning I would be just as excited, as if I’d had a full night’s sleep. Next morning would be a fiasco for me, I’d jump out of bed extra early so I could get every aspect of my costume just right, pinned properly to stay in place, with impeccable face paint or makeup. The bus ride there was a pain, being squished in with all those other kids, but I endured it because when I got I would probably have the “funnest”(that was my favorite word as a kid) day of my life. I’d spend all day doing Halloween themed math problems, reading scary stories in English, and watch my science teacher be a mad scientist, and then at the end of the day there would be a party and the all the kids would stuff their faces with ridiculous amounts of Halloween themed junk food. Needless to say, it was a blast for any elementary/middle school kid. But I was only a kid, and eventually had to face the scary reality of growing up. Upon entering high school, everything became a lot more serious. There were so many aspects of life that changed, but just to sum it it: high school is all work no play. Needless to say, Halloween became toned down, almost to the point of non existence. Nearly everyone is too tired to bother dressing up, or too lazy to do so. The whole day is full of serious, work, with minimal holiday influence. In the end, Halloween has turned into almost a normal day for me. 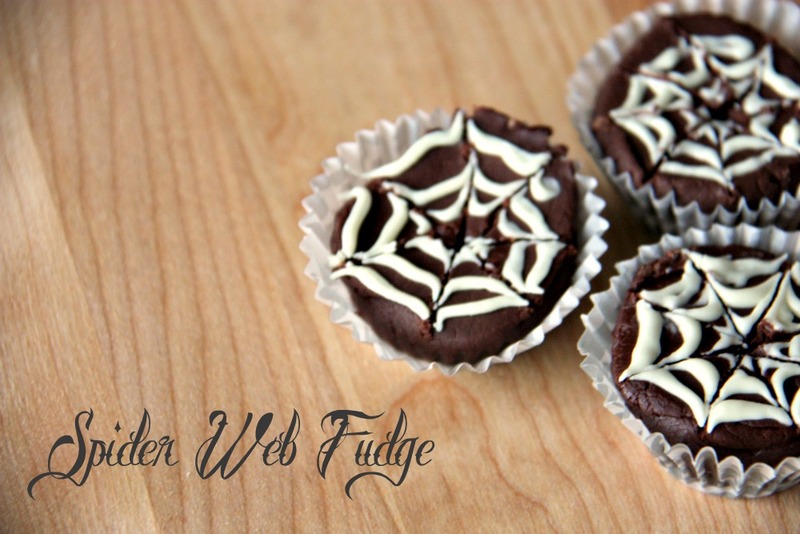 However, this year, I’m definitely attempting to have some holiday spirit, and I made these little spider web fudge bites for a party that I’m attending. 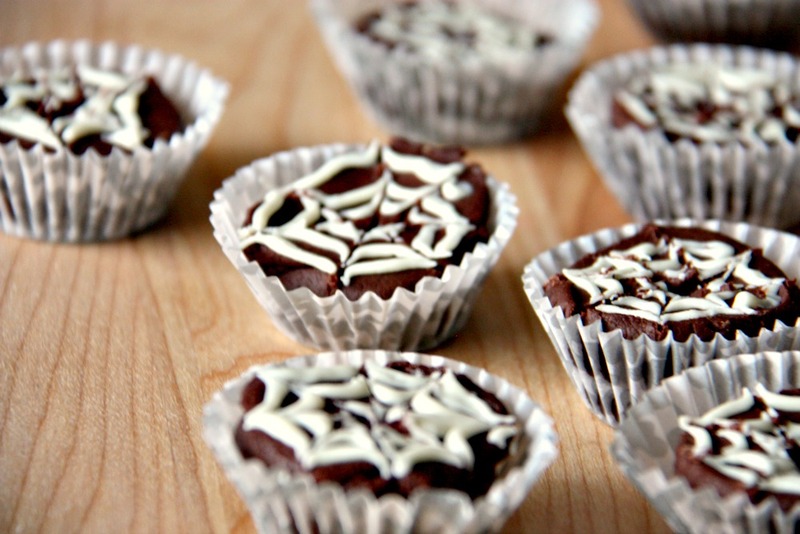 These fudge bites, are super easy to make, and are just a simple variation from my cheater’s fudge recipe. They’re really perfect for parties, because they look cute and Halloween themed, but don’t take much effort to make. I also created gifs demonstrating some of the steps, so that it’s easier to follow! Split all the ingredients for the cheater’s fudge in half. We’re doing this because white chocolate tends to cool fast, so it is easier to work with one half of the batch first. Put the baking cups into the muffin tin. So following the instructions for the fudge up to step three, make the first half of the recipe, and mean while, create a double boiler for the white chocolate, by filling a pan halfway with water, putting the while chocolate in a separate bowl, and setting that bowl in the water of the pan. make sure NO water touches the white chocolate, because it will not melt properly. After you’re on step three for the fudge, and the white chocolate is melted, take the fudge base, and scrape it into the bigger piping bag, and pour the white chocolate into the smaller piping bag with the thinner tip. if you are using a ziplock bag: take the smaller bag, and cut a very small amount of the corner off to create a very small hole, be careful not to cut too much, it is very easy to underestimate the size. Then take the larger ziplock bag, create a larger hole, you should be able to put your finger through the hole and still have small amount of space around your finger. You will put putting the fudge in the larger bag, and the white chocolate in the smaller bag. From this point on begin working quickly, because the white chocolate will harden over time. Pipe the fudge into the cupcake liners, keeping the point of your piping bag/ziplock bag at the center and letting the fudge spread out from the tip and moving the piping bag up gradually until the cupcake liner is almost full. Pipe the fudge into all of the cupcake liners until you have nothing left. Then take a spoon, and even out the surface of the fudge. demonstrated below in the gif…(I apologize for the bad pictures, I was using one hand to take pictures, and the other to demonstrate…). Then, taking the white chocolate bag, pipe a swirl on the surface of the fudge, as demonstrated below in the gif. Put the tray into the refrigerator to cool, then repeat again for the second half of the batch, or just make one half :) You can remove the cupcake wrappers fairly easily if you want to remove them, or just leave them on there. Looks so delicious and festive! Yummy, i love the spider web! What a lovely Halloween idea. Oh, I love how the tutorial turned out – like a video! This is a great Halloween idea. My kids will be begging for me to make these! This is such a cute idea. And yay for the animated GIF! :D I need to start doing those again. Enter your email here to subscribe! Copyright © 2011 The Notorious Experiments. All rights reserved.